Wow, this is a significant step forward for Il-2. Thanks for your continuing efforts Pablo! A quick question for you WW2 ground-scanning radar experts, could individual buildings be made out with H2S or H2X? I know big structures like dams were visible, but what about city blocks, factories, cathedrals, etc? could individual buildings be made out with H2S or H2X? I know big structures like dams were visible, but what about city blocks, factories, cathedrals, etc? Hoover dams were visible because they were sorrounded by water which reflected the radar signals away from the sender (angle of incidence is equal to angle of reflection). You can see what cities look like here, it's the city of Cologne right after a bomb raid. All you can see is whether or not there's a city, then you can guess it's shape, and you can see the river rhine. 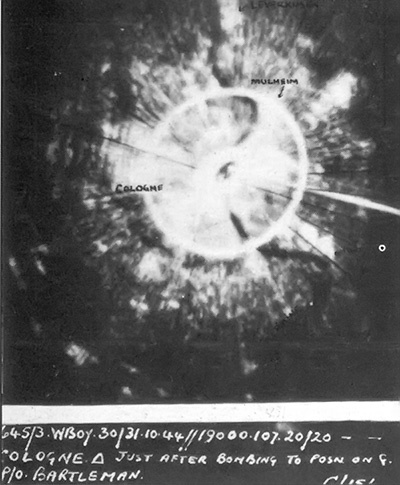 This is a frequency thing, the H2S in the beginning used a frequency of ~3.2 GHz, later it was enhanced to a Microwave radar (8-12 GHz, H2X) and eventually 20GHz (only after war) which enabled the detection of water particles (clouds). The latter would be able to detect buildings (at least larger ones) at low level too, but for a heavy bomber this is a rather theoretical thing. Another thing to bear in mind with the early ground scanning sets (H2S, H2X) was that the parabolic dish, although it rotated 360 degrees, was on a fixed bearing of declination (60 degrees i think). So the PPI plot tended to give a better representation of the ground as the plane approached and went away from a target, the image directly below being somewhat less clear, you can see this a bit in Mikes picture of Cologne. But theoretically an operator should be able to tell between built up areas, wooded areas etc as they reflected more of the radar waves. The image was by no means that clear though and would probably not resemble the image on a map say, except for clearly defined areas coast line, rivers, lakes etc. Indeed i know RAF Bomber Command had H2S printouts or images of some areas to help operators recognise features and targets that would not be that recognisable. These were the very first kind of radar sets, and while much better than none at all still needed a very proficient and skilled operator to get the best out of them. Partly the reason why most early H2S sets went to Pathfinder crews who were generally on their second tour of ops, and therefore more skilled than the average bomber crew. Very impressive work Pablo, for us non-coders.